About the best spider theater in town is about to close in a few weeks – the live-animal floor show inside the American Museum of National History’s Spiders Alive! exhibition, where an actual spider-handler enthralls the crowds with myth-busting tales while introducing the arachnid star of the show, a Chilean Rose Hair Tarantula. Nearly 20 live species are crawling around the terrariums, but crowds are flocking to the live demo/theater area of the show and sitting spellbound until intermission. Go see it! Since the AMNH never does anything second-rate, it’s fitting to note that welcoming visitors to the show is an art-world superstar. 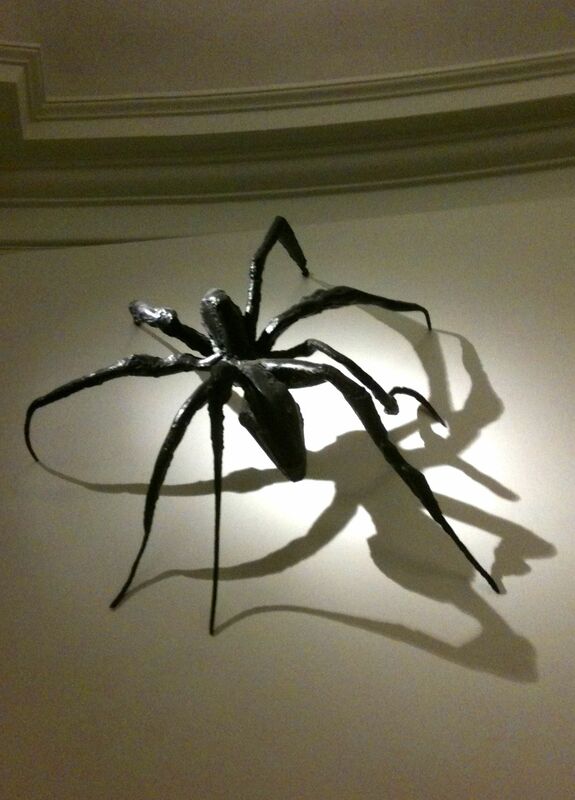 Lurking inconspicuously in the “canoe” lobby area outside the show is one of the smaller bronze spiders crafted by Louise Bourgeois. It’s smaller than the babies that graced the 1999 opening of Tate Modern’s Turbine Hall in London (and later the Guggenheim in Bilbao and Rockefeller Center), but who cares? Stop by for a glimpse. 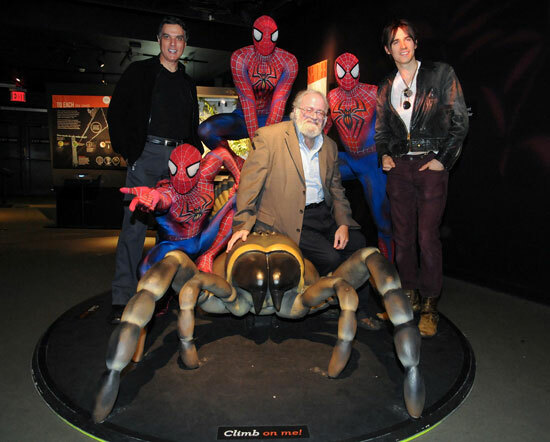 And lest you think that AMNH ignored the other obvious art-world connection, it didn’t, as shown by this amusing photo in September, when the cast of that other spider-themed show came to visit AMNH curator Normal Platnik for a walk-through. Check out the opening-day YouTube promo below, but go meet the spiders up close and personal before they leave after January 6. If you’re a sci café geek that wants more, go poke around the AMNH World Spider Catalog. This entry was posted in Art, Museums, Nature, Theater and tagged art, museums, nature, science, theater by mssusanb. Bookmark the permalink.